AM turnip price is 54 bells. Gag. 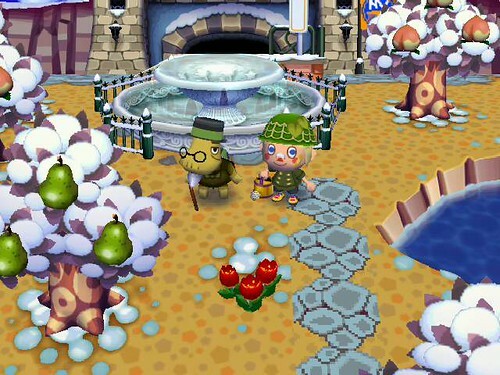 I’ve been playing Wild World a bit more lately due to the grass/snow problem here in Shaolin. I was just thinking to myself that it was interesting how much more frequently you receive letters from “Mom” in Wild World. But this morning I got a letter from “Mom” in City Folk, the same old nonsense. So I guess “Mom” can control her empty nest syndrome a little better in this game lol! YAYYYY the fountain is complete! Woo Hoo!!! Ugh, but Tortimer is like standing guard and won’t let me try throwing my axe in. I guess I have to wait until tomorrow? Weak. Hide and Seek time! Woot! Gotta find Monique, Daisy and Rowan in 10 minutes! Oh, it was easy! They were all hiding in the same general area. They gave me a gyroid as a present. That’s cool I guess. I just spoke to Grizzly and he said he was planning on leaving Shaolin. Kinda sad I guess, but I want new neighbors so I don’t mind if he leaves. PM turnip price is 50 bells. Double gag.